The Master Crystal Deva Lemurel: “Open to my all-encompassing love and be ow present. Step forward into the uncharted waters of life’s experience, I have come to guide you. Let there be no fear in our union, as continuous Joy is your divine right. Today I offer the spark that will re-light the flame of individuality within you, allowing your unity with all to become known once again. Feel my Yellow Fire blessing the Solar center of self and link it to the pureGreen Ocean fo your unconditional Heart. Under the perfected guidance of the Eternal white light, you and I are now One. Chrysoprase in Healing: “Chrysoprase is an opaque stone that is similar to Jade, but lighter. It contains a lot more yellow and white in its frequency and makeup. Chrysoprase has become quite a rare stone and nice quality natural pieces can be hard to find. This is principally because it was aggressively exported out of Australia where it is primarily found, into Asia and sold as Australian Jade, which is one of its other names. In healing, this mineral’s purpose and ability is given away by its color, Chrysoprase is the crystal of Fearless Movement. It achieves this by powerfully activating the yellow Solar Plexus Chakra for identification of self and connecting it to the open unconditional green vibration of the Heart Chakra. With the presence of white in the stone, it then involves the Crown Chakra, linking to spirit for guidance. The outcome is Crown, Heart, and Solar Plexus working in harmony to direct life in a fearless manner due to the presence of spirit, unconditional love and understanding of self without ego. With its powerful ability to link to spirit through an unconditional green heart frequency, work with this stone leads to a greater understanding of the cycles in physical life, which integrates a great acceptance of self and others, with a high level of hope, compassion, and forgiveness. This aspect of Chrysoprase can powerfully heal a broken heart and is a teacher for men that have lost their feminine balance. Chrysoprase is a contact stone for Ascended Master Djwhal Khul and Master Lanto who work well within its frequency. At a more physical level, Chrysoprase is a specific stone for the Prostate Gland, Testicles, and Ovaries. It has been known to reduce Stress, Nightmares in children, increase Fertility, and help in balancing Hormones and Depression. 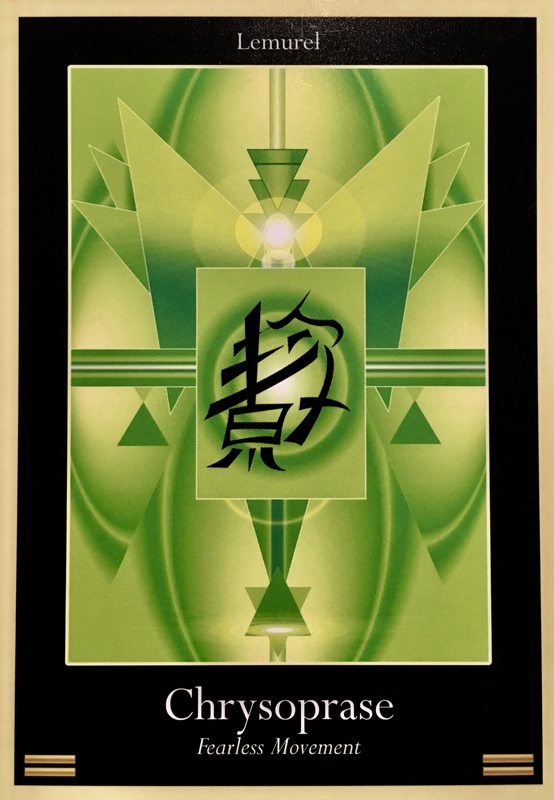 Your Healing Journey Today: “The presence of Chrysoprase for you, signals the opening of a new and creative pathway that will be filtered through the heart under the guidance of your highest parts. Chrysoprase helps us to recognize our infinite nature if we embrace unconditional love, and being of the green frequency, guides us in allowing that to come into the physical world, Chrysoprase is very much about following your heart, a practice that often creates the most beautiful things in the world, but in order for it to do this, personal power and your individual spirit must be taken along on the journey. These are the Yellow and White energies of Chrysoprase and her most precious gifts for you. It seems you are ready for action, Link the Crown, Heart and Solar Plexus Chakras together each morning with light and fearlessly manifest the waves of movement that you came to create. Chrysoprase is all about opening the heart to more light. It is about healing, and joy and fearlessness and strengthening the connection between Earth and Heaven with us as the conduit. It is a stone of high vibrational Loving, unconditional acceptance, abundance and prosperity. It facilitates self love and acceptance and gives us the strength, will power and confidence to move forward in love, putting it all out there and opening up to something much deeper than we have previously experienced. Yet there is an aspect here of Lightness of Being, of fun and not taking life too seriously. Chrysoprase reminds us that life is wonderful, if we allow it to be; and that adventure awaits us around every corner, if we are open to it. It is time to release fear and open our hearts wide. It asks us to look at how we are expressing ourselves, and what and whom we wish to manifest into our reality. Is it love that you yearn for? Now is the time to open yourself to it, it may come in a package that you are unfamiliar with… step out of your comfort zone and trust your heart. Are you embracing the opportunities presented to you at this time? Open, receive, believe you can have it and do it all. Place a Chrysoprase on your heart chakra and feel it lighten the load. Old wounds don’t seem so heavy anymore. See your heart filling with bright and bright green light, see it opening and radiating this green light out in all directions. Know that you are healing as you are being healed, and nothing will ever be the same. The past projections of fear and pain are gone, the slate is wiped clean and you are about to start a whole new adventure in Love.